Are you an innovative and highly qualified energy service provider or promoter? Have you implemented a successful and pioneering sustainable energy project? 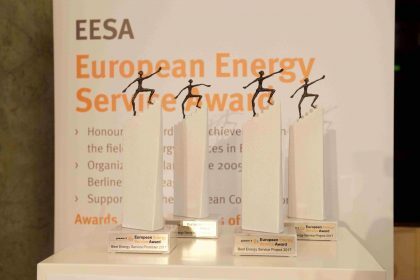 This is your opportunity to apply for the European Energy Service Award (EESA) 2019! Open to companies, institutions or individuals having made a strong contribution to the development of the energy service market, addressing existing barriers and implementing solutions to overcome these barriers. Open to Energy Service Companies contributing to new market development with the readiness to take risks, showing innovativeness in technical implementation, exemplified in a successful milestone project. Projects can be from all sectors and should show excellent results in climate protection, application of innovative technologies, or customised solutions addressing specific customer needs. A maximum of three projects will be awarded in this category. Find application documents and further information at www.guarantee-project.eu. Closing date for applications is 15th January 2019. The winners will be selected by an international jury and awarded at a ceremony to be held in Brussels at the beginning of 2019. The EESA is organised by Berliner Energieagentur in the context of the project guarantEE, funded by the European Commission's research and innovation programme Horizon 2020.